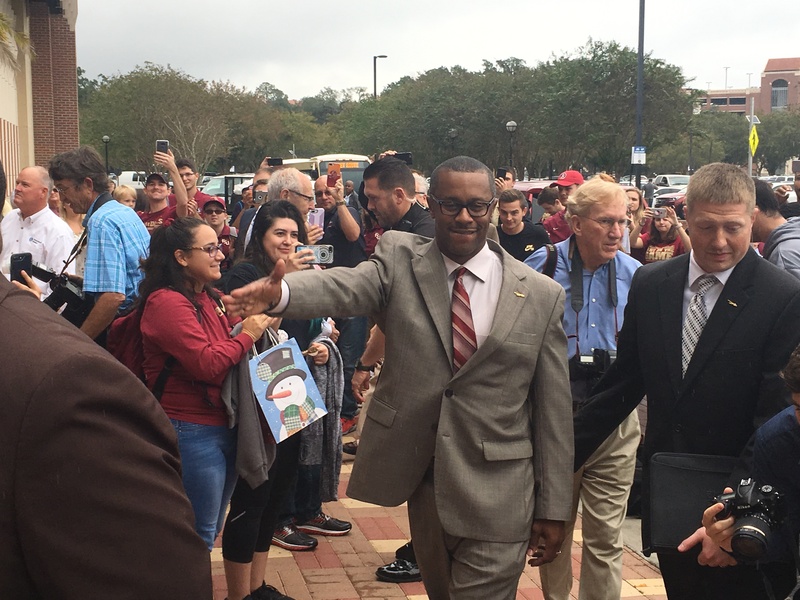 First-year Florida State head coach Willie Taggart may be just 47-50 in his career as a head coach, but the Seminoles will be the first program he’s inherited that wasn’t a complete rebuilding project. In fact, FSU is the first program that Taggart has taken over that didn’t have a losing season in the year prior. Florida State fans are hopeful that many big wins are in Taggart’s future, but there are a few noteworthy contests in the past. Willie Taggart’s last game at Oregon may have been his most memorable as the Ducks blasted rival Oregon State. Taggart’s lone Civil War contest would be the largest margin of victory ever in the rivalry. Oregon racked up 577 yards of offense and forced three turnovers in the win. Justin Herbert passed for three touchdowns while Royce Freeman and Kani Benoit each rushed for 122 yards. The two combined for three touchdowns on the ground. Justin Hollins also returned an interception for a touchdown. Willie Taggart’s first ACC road game at FSU will come at the location of his first road win over an ACC school. With USF sitting at 4-0 and making the long trip to Upstate New York to face Syracuse, things didn’t start swimmingly for the Bulls. South Florida fell behind 17-0 early before erupting for 28 second-quarter points in what would be a rout of the Orange. Rodney Adams scored three total touchdowns for USF in the win while Marlon Mack rushed for 115 yards and two touchdowns on nine carries. D’Ernest Johnson returned a punt 83 yards for a score. The Bulls’ defense forced three turnovers. Navy was ranked 22nd in the country and undefeated in American Athletic Conference play as it headed to Tampa on the final Friday night in October. Before the Midshipmen could even blink, they were down 28-0. The Bulls held that lead after one quarter and took a 42-14 lead into the locker room. The contest wasn’t nearly as close as the final score as Navy scored two touchdowns in the final 2:28 including one as time expired to make it look close. USF accounted for 629 yards in the win, including 411 on the ground. Quarterback Quinton Flowers accounted for 395 total yards and four total touchdowns. Flowers, Marlon Mack and D’Ernest Johnson all eclipsed the 100-yard rushing mark in the win. In his brief time in Tallahassee, Willie Taggart has been quick to bring the legendary Bobby Bowden back into the fray. Early on 2012, Taggart channeled his inner-Bowden with a decision to go for two and the win in an overtime contest against Kentucky in Lexington. The Wildcats scored a touchdown with 24 seconds left in regulation to force overtime and took advantage of their first possession in the extra period with a score. After Antonio Andrews punched it in from two yards out for a Western Kentucky touchdown, Taggart reached into his bag of tricks. Taggart put the ball back into Andrews’ hands, but this time to throw. Andrews took a lateral from quarterback Kawaun Jakes before throwing it back across the field to Jakes who walked in for the winning score. It would be Taggart’s first win over a Power 5 team. After a 1-3 start to the 2015 season at South Florida, Taggart found himself on the hot seat and needing to make a statement. The Bulls had gotten to 5-4 when No. 22 Temple came to town for the final Saturday contest of the year. The Owls scored first, but from there on, it was all USF. The Bulls took a 31-10 lead into the locker room before cruising to victory. USF put up 556 yards of offense in the win. Running back Marlon Mack accounted for 272 yards from scrimmage and three total touchdowns. The win was the first for Taggart over a ranked opponent. Prior to the contest, Taggart was just 11-22 at USF. From that day on, he was 13-3.